Review: 'Down The Road Wherever,' Mark Knopfler Builds A Village Everything about Down the Road Wherever feels warm and inviting; if each song is a miniature room, their display is in a cozy den that also boasts a roaring fire. Some of the figures on Down the Road Wherever seem to want a return to some long-gone glory days, but Mark Knopfler only sketches out the what of their wistful desires, not their why. In 1932, Chicago artist and arts patron Narcissa Niblack Thorne began an unusual and extraordinary project: designing intricately decorated, historically accurate rooms in miniature. Married to James Ward Thorne, heir to a Chicago department-store fortune, she used some of her substantial means to employ out-of-work artisans who could build everything from wee rococo French end tables to minuscule Shaker cabinetry. Their ornate detail is breathtaking — they're even lit in a way that appears to mimic clear mid-morning sun. All these rooms are missing, it seems, are the people who live there. 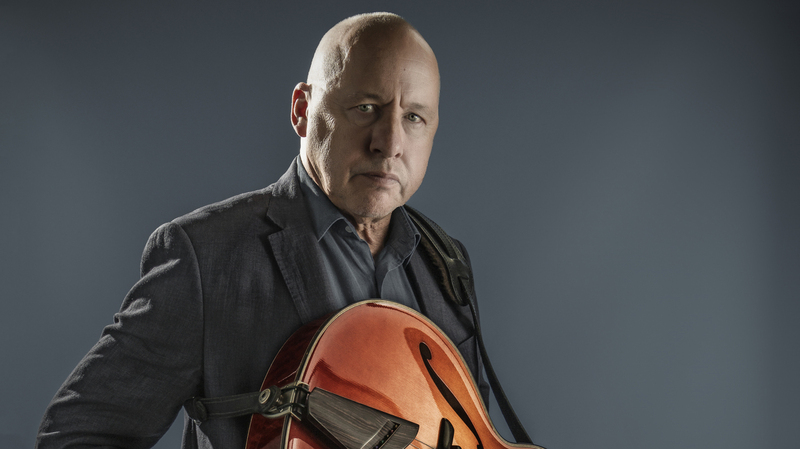 With Down the Road Wherever, his tenth solo record, former Dire Straits frontman Mark Knopfler deploys many of the same charms as Thorne's renowned curios. While it's hardly a concept record, Knopfler builds his own miniature village and the details with which he colors his cast make it easy to imagine his many characters living among each other. Knopfler begins with "Trapper Man," a number about a skilled trapper who makes a butcher's block out of a trader's desk that feels more like a subtle allegory for the dirty work that gets done in order for the finer things in life to exist. Knopfler's characters feel neither autobiographical nor entirely fictional, thanks in large part to his apparent knack for understanding the human condition. It's easy to imagine the narrator of "My Bacon Roll" as a longtime barfly who's rather chatty, if possibly a bit lonely, too. As with the gentleman protagonists "going for the major comeback" in wingtip shoes and Stetson hats on "Back on the Dance Floor," some of the figures on Down the Road Wherever seem to want a return to some long-gone glory days, but Knopfler only sketches out the what of their wistful desires, not their why. Knopfler wraps his detailed narratives in tastefully arranged instrumentation, which ranges from the twangy "Just a Boy Away from Home," to the slow-burning drift of "Slow Learner," to dance-friendly shuffles on "Good On You Son" and "Heavy Up" (on "Nobody Does That," Knopfler even toys a bit with funk). Light touches of fiddle and allude to Knopfler's roots in the British Isles, while horns add flares of soul. Even Knopfler's guitar solos feel politely reserved. Though he's a celebrated guitarist several times over, Knopfler treats his solos as equally important elements in carrying a song to its conclusion rather than opportunities for flashy grandstanding. There's a grandfatherly charm throughout the record, both in the comfortable arrangements and Knopfler's lyrical yarns. Everything about Down the Road Wherever feels warm and inviting; if each song is a miniature room, their display is in a cozy den that also boasts a roaring fire, capacious armchairs, heirloom quilts, and a smell like pipe tobacco and old books. But Knopfler leaves room for the bittersweet, as on the ambling "Drover's Road" and "Floating Away." At times, Knopfler tells bits of his own story, as on "One Song at a Time," where he sings about his own life's journey (and wryly notes that he's done watching "poor old fakers / Trying to dance in my old shoes"). Down the Road Wherever's final track, "Matchstick Man," breaks step from the rest of the record, in both its length (it's the LP's shortest track by more than a minute) and its stripped-down execution. Accompanying himself on acoustic guitar, Knopfler sings of a lone traveling musician, who, in the song's final lines, is but a "speck upon these vast and silent plains of snow." Knopfler's closing maneuver completes the album with a cinematic flourish, one that makes a surprisingly clean finish for such a richly detailed record.